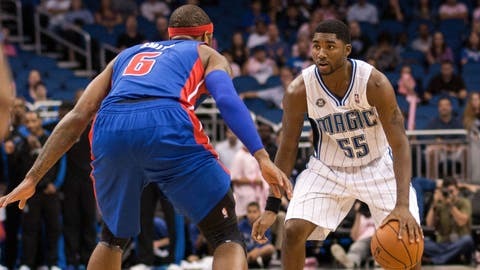 Detroit Pistons small forward Josh Smith (6) defends Orlando Magic shooting guard E'Twaun Moore (55) during their meeting in October. The Detroit Pistons have proven nearly unbeatable on the road over the last four weeks. That doesn’t bode well for the Orlando Magic, who haven’t had much of a home-court advantage. The Pistons try to continue their recent road success Friday night when they visit the last-place Magic. Detroit (14-16) has won seven of eight away from home, with its only loss over that stretch coming 111-106 in overtime at New Orleans on Dec. 11. "On the road, all we have is us," veteran guard Chauncey Billups said. "We know we have to stick together when their crowds get going and they go on runs." The Pistons matched their most points this season their last time out, easily winning 115-92 at Cleveland on Monday. Josh Smith led seven Pistons in double figures with 25 points while Brandon Jennings scored 21 to go along with 13 assists. "To me I think, it might sound silly, but it’s the fact that we are shooting around at the arena," said Jennings, averaging 20.5 points on the road compared to 15.0 in Detroit. "At home, we don’t have shootarounds at the arena. I’m not saying it’s an excuse, but we’re not really used to the arena because we don’t have it at the practice facility. If that’s where we play, that’s where we need to try to have shootaround." The Pistons could be feeling good about keeping things going in Orlando, where the Magic (8-20) have dropped five straight and eight of nine. Orlando saw those woes continue Monday in a 103-98 loss to New York. The Magic, who were outscored 36-14 in the second quarter, cut into what was a 25-point deficit but couldn’t complete the comeback. "We were close and it’s disappointing to not get the win, but we fought hard. I just hate saying that we fight hard," forward Tobias Harris told the team’s official website. "As a player you can’t like losing and I hate losing. I want us to do better. … For us as a team, our first half has to be more important to us." Arron Afflalo, averaging 25.0 points in his last four games, scored 26 while Glen Davis added 20. Jameer Nelson had 17 points, 10 assists and a season-high eight rebounds. "Until we develop the concept of (doing) not just what’s a basketball play, but doing what’s going to help us win games, we’ll be back and forth," said Afflalo, who spent the first two seasons of his career with Detroit. "We didn’t come in here on our home court and just lay down. Giving a fight doesn’t mean much to me, but it’s worth something." The Magic are 0-17 when allowing at least 97 points compared to 8-3 when they don’t. The Pistons have reached triple digits in each of their last seven road wins. Orlando will try to contain Smith, who is averaging 23.8 points and shooting 49.2 percent over the last six games, well above his season marks of 15.8 and 41.4. "Working in the paint is the strength in our game, so I’m making a conscious effort to not settle for shots," said Smith, whose team is averaging an NBA-best 52.1 points in the paint. "I’m used to being a little selfish, but I can be a distributor when other guys get hot." Smith compiled 20.0 points in his last eight matchups against the Magic while with Atlanta. Orlando has gone 3-5 during an eight-game stretch versus Detroit after dropping the last two meetings. Magic forward Jason Maxiell faces his former team for the first time.